Have you ever been put off an author’s books after reading a biography of them? Or the reverse - a biography has made you love an author more? The short answer is that I haven't encountered this issue since I have yet to read a biography about an author. However, if the term biography is not merely meant to imply a book written about a particular author but includes the blurbs found inside of books about the author, their descriptions on their own or other websites, or even comments they may make on a blog, in an interview, or what have you, then my answer will require a more lengthy response. How many readers bother to read the little bio blurb about the author that often is printed in a book? *Raising hand. * I do. I think it is interesting to find out a little bit about the author's background, be it past professions or published work ( I especially love the humorous bios), interests other than writing, or whether they have pets and children, for example. I like to link authors' websites along with my book reviews when I can find them. During my visit to an author's website to collect the URL address, I often will peruse the site, usually making the "About the Author" page one of my first stops. An authors bio may not influence my enjoyment of a book, but sometimes it can lend credibility to the topic at hand or shed light on certain aspects of the book. The acknowledgments and dedications can also be quite revealing. Whether I like the author's work or not is going to be my main motivating factor in whether I pick up another of that author's books. And that's even throwing in personal beliefs and opinions. I am able to separate the writer from the book. After all, even my husband and I do not see eye to eye on everything and I still love him, not to mention all the friends, family, and even bloggers, out there that I get along with just fine despite our differing views. I cannot think of an instance when I have decided against reading a book because the author and I do not share the same views or ideologies. Sometimes, though, the differences might be a more compelling reason for me to read something by a particular author if there's a bit of a controversy tied into it. I'm the kind of person who likes to see what all the fuss is about. Like many of you, I would rather not be lectured or preached to in books. I do not mind reading about differing viewpoints, but I do care about the presentation. If I feel like something is being forced down my throat, I am more likely to balk than be open to hearing another side of an issue. There are certain issues I feel very strongly about, and, as a result, I may choose not to read a book that focuses on themes opposed to my beliefs, but there are exceptions. It just depends on the book. That really is what it comes down to for me. The book. Is it a book I am interested in reading? If it is, then nothing else really matters. At least, nothing I have run into yet. Questions courtesy of YellowRose this week; thanks, friend! And...here we go! 1. Please don't tell me you didn't bring the tickets. 3. The colorful rainbow outside makes me want to grab my camera and snap a picture. 4. I have a craving for something salty. 5. If my life had a pause button, I'd pause it in that moment that you smile just so I can memorize every detail. 6. Eyes are the window of the soul. 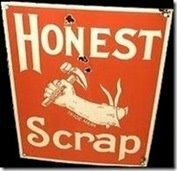 Trisha from Tripping over My Tongue recently awarded me with the Honest Scrap Award. Thank you, Trisha! List 10 honest things about yourself - and make it interesting, even if you have to dig deep! Making them interesting is going to be the hard part! Let's see . . .
2. When I eat M&M's, I separate the candy out by color. Sometimes I eat all of one color before moving onto the next, always saving the green for last; or, more often, I eat one from each color and work my way through them as evenly as possible, making sure I always eat a green one last. If there's an uneven number of colors, which is almost always the case, I will even out the colors first, but eating the "extras" to start with. 3. Why do I always save green for last? Because it is my husband's favorite color. 4. Although I am not a sports follower, I do enjoy watching some sports on occasion, particularly in person. I especially like going to professional baseball and soccer games. 5. I have an irrational dislike of American football. 6. I once saw the 49er's play at Candlestick Park in San Francisco. The tailgate party was the best part. 7. I've got sports on the brain right now because my husband and I just splurged on tickets to see the L.A. Galaxy play this spring (3 games). 8. I played soccer for 4 years. 9. I wasn't very good at it. 10. I'm going to go read my book now. I am not going to tag anyone for this one, but if you would like to play along, please do! Be sure and let me know so I can stop in and see your list of 10 confessions. 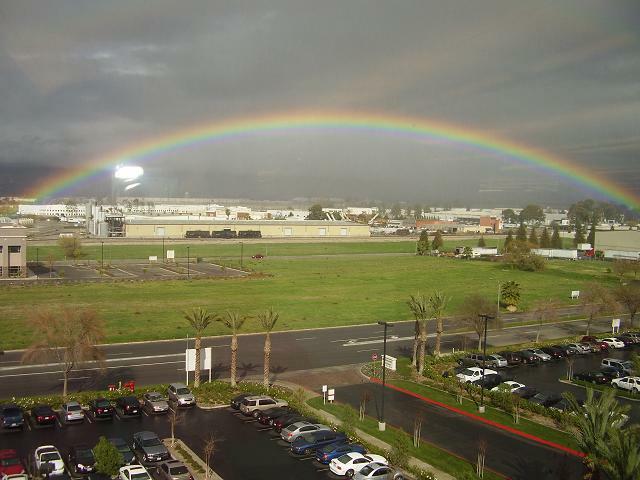 View from my husband's office window, February 6, 2009. Nice post but the photo is WOW!!!! Great post! I hope you don't mind that I tagged you on a photo meme. Loved your thoughts on the biography question. I don't read many biographies but in the end I agree with you, if I like it I'll read it, regardless. Your fill-ins were great..did the fur balls let you sleep in? The photo from your hubby's office window is breathtaking!!! I've only read one biography about an author before but only because it was Dr. Seuss! Great picture! Today we're seeing rain outside the windows and not rainbows :-). I like your BTT answer. In most of the posts I've read, people seem to be inclined to judge the work on its own merits and react to the ideas, and not so much to the author personally. I share your dislike of American football. Thank goodness it will be baseball season soon! Football is confusing and dull. Usually I would pursue the life of authors if the books have engaged me. I let the book speak for itself. Whether I like a book or not is based entirely on my own interest and motivation. Your playing soccer is one *huge* revelation! :) Have a great weekend. Beth - It is a great photo, isn't it? Yvonne - Thanks! And thank you for tag! Staci - Thank you! I haven't read too many biographies in general either. I really like that photo too! I hope you have a great weekend too. Florinda - Thank you! We got some rain today as well, but no rainbows outside my window either. The BTT question seemed really timely with all the other similar discussions going on about that topic as well. It's been interesting to get everyone's take on the subject. Carrie K - LOL I'm with you there! Football is definitely that. Matt - Very well said! My soccer years were when I was still in school, admittedly. :-) I hope you have a great weekend too. *Raise hand* I will read word for word on the author's bio. In fact, I read a book from cover to cover (not necessarily in that order as I sometimes finish the story first before I read the other parts). That's a beautiful photo of the rainbow! "I'm going to go read my book now" I LIKE THAT! And I have a blog award for you too. Come see it here. It is a great photo, isn't it? I wish I had seen it in person. I always ask my cat to let me sleep in, but she never complies. It's always "6 am - I want attention!" I love to read about the author, so like you I do read the bio. I sometimes go to their website ahead of time to get a sense of who they are. I can separate the author from the book, however at times I think depending on the book, "the book is the window of the soul". My high school roommate ate M&Ms by color. We'd buy the giant bag and pour them into a bowl. It took me forever to realize what she was doing- one day there were only green and yellow left and a lightbulb went off. I agree; it's the book that counts! I don't think I've ever not read a book because of who wrote it. Wisteria - Yes, I agree, sometimes the book does say a lot about the author. Lisa - Now that would be an interesting project. Buy a giant bag of M&M's and eat all of one color at a time. See if anyone notices . . . :-) I usually just stick to the handful I grab when eating by color. Linda - Thanks! For me, it really is the book that counts. I loved your answer to BTT. I'm curious about author's biographies too, but I try to separate the fact of their lives from their work as much as possible. I always read a book from cover to cover. ;P I want to know everything about the book, the author and how the story comes about if the author had the interest of sharing them with the readers. I like these little discoveries! That's a beautiful pic you posted, Wendy! Another M&M color separator! It's nice to know I'm not alone. :-) I'm not sure saving the green for last because it's my husband's favorite color is a good reason--but it works for me. Melody - Me too! It just doesn't feel complete unless I do. I am glad you like the photo! I read the author bios too, and acknowledgements and pretty much anything that can be read between the covers.